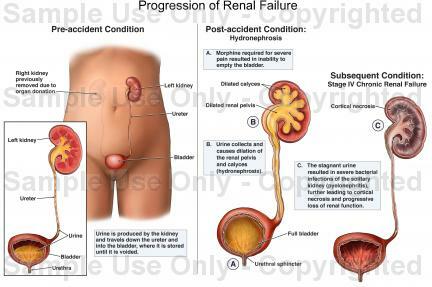 An acute kidney failure (AKF) is defined as an abrupt or rapid decline in the filtration function of the kidney. This condition is characterized by a marked decrease in serum creatinine concentration and a progressive retention of metabolic waste products such as blood urea nitrogen concentration. Immediately after a kidney injury, BUN or creatinine levels may be normal and the only sign of a kidney injury may be a decreased urine output. Physiologic conditions that lead to a decreased perfusion of the kidneys without intrinsic damage are identified as pre-renal acute kidney failure. A pre-renal acute kidney failure is the most common form which is basically related to a decreased tissue perfusion in the kidneys which could lead to intrinsic AKF when not promptly corrected. The pre-renal etiologic factors include volume loss or depletion, decreased cardiac output resulting to decreased perfusion, systemic vasodilation and afferent arteriolar vasoconstriction. Physiologic conditions that damage the renal tubules, nephron or renal blood vessels are considered intrinsic or intra-renal acute kidney injury. When there is prolonged decrease in renal perfusion, the kidneys gradually suffer damages that are not readily reversed with the restoration of renal perfusion. The underlying pathophysiologic abnormality in intrinsic acute renal injury is renal cellular damage. Damage to glomerulus allows protein and cellular debris to enter the renal tubules leading to intraluminal obstruction. Physiologic conditions that partially or completely obstruct urine flow from the kidney to the urethral meatus can cause port renal failure or post renal AKF. Partial obstruction increases renal interstitial pressure which in turn increases Bowman capsule pressure. Complete obstruction leads to urine back up in the kidney, eventually compressing the kidneys. There are different types of symptoms that manifest from an acute kidney failure. The extent of the severity of these symptoms will depend upon the injury caused to the kidney that will affect the kidney's ability to perform its functions. The following are common signs and symptoms that are seen among patients with AKF. A collaborative approach to the treatment of patients in a kidney injury begins with early recognition of patients at risk for renal failure. The focus of the management is on maintaining adequate renal perfusion and avoiding renal compromise. The measures of treatment are correction of fluid overload, correction of severe acidosis with bicarbonate administration, correction of hyperkalemia, and correction of hematologic abnormalities with transfusions, and administrations of Desmopressin or estrogens. The current treatment of AKF is mainly supportive in nature and no therapeutic modalities have shown efficacy in treating the condition. Maintaining the fluid balance is a real challenge for kidney injury patients. A fine balance must be achieved by providing adequate fluid to ensure proper renal perfusion while preventing fluid overload. Furosemide can be used to correct volume overload while the patient is still responsive. Although this cannot convert oliguric AKF to a non oliguric or in increasing the urine output when a patient is not hypervolemic, response to furosemide is a good prognostic indicator. Drugs metabolized or excreted by the kidneys should be adjusted to avoid excessive blood levels and potential neprotoxicity. All nephrotoxic agents should be avoided or used with extreme caution. Similarly, all medications cleared by renal excretion should be avoided or their doses should be adjusted properly. Dietary changes play an important role among AKF patients. Restriction of salt and fluid becomes crucial in the management of oliguric kidney injury wherein the kidneys do not adequately excrete either toxins or fluids. Restriction of potassium and phosphorus may be necessary as they are not excreted optimally in patients with AKI. However, in the polyuric phase of AKF, potassium and phosphorus may be depleted, thus they might need supplementation for these elements. The RRT is applied for 4 hours or more with some requiring a continuous use of the therapy treatment. Hemodialysis is initiated when aggressive therapy is indicated in acute situations. This is contraindicated for patients with hemodynamic instability, hypovolemia, coagulation disorders or vascular access problems. This is considered the gold standard for the treatment of acute kidney injury and this is considered the most effective of all RRTs. Fluid and uremic wastes can be eliminated from the body during 4- to 6-hour treatment. Approximately 200 ml of blood is utilized in the circuit which can add to the patient's unstable condition. The basic components of hemodialysis system include the blood which is leaving the patient through the arterial needle, and then it is pumped through the circuitry and returned to the patient through the venous needle. A blood pump moves the blood through the dialysis circuitry and dialyzer, allowing for different flow rates. Peritoneal dialysis is usually indicated for critically ill patients who need dialysis but are unable to tolerate the hemodynamic changes associated with hemodialysis. Utilizing the peritoneal membrane as the dialyzer, effective elimination of fluid and waste products can be achieved. Peritoneal dialysis is slower and less effective than hemodialysis. Peritoneal dialysis is contraindicated for patients who have had recent or extensive abdominal surgery, who have abdominal adhesions, peritonitis, respiratory distress or pregnant. Slow continuous Ultrafiltration is primarily used for patients with fluid volume excess and some degree of renal failure. Because fluid removal is the primary goal, this procedure is performed without simultaneous fluid replacement. Continuous Venovenous Hemofiltration is another type of RRT which main objective is to remove excess fluid in the body. There are no absolute contraindications for CVVH. A major advantage of this type of RRT is a decrease in access-related complications because there is no need for arterial access. Unfortunately, the therapy has to be discontinued for transportation off the unit during selected diagnostic tests and continuous nature of therapy limits the patient's mobility. Continuous Venovenous Hemodialysis combines the principle of hemofiltration with a slow form of dialysis. Selection of CVVHD is generally made because the patient is unable to tolerate the rapid fluid and electrolyte shifts that occur during hemodialysis. The early treatment and management for an acute kidney failure is essential in order to prevent further complication of the disease. If you care enough for your loved ones with the condition it is best to consult a physician now to obtain an early treatment. Doctor’s Order : For The Best Kidney Disease Solution – Click Here!